American Samoa Says It Has 205 Suspected Cases Of Zika : The Two-Way The news was announced recently by health and government leaders in American Samoa, which has a population of about 54,000. Aedes aegypti mosquitoes like these are known to carry the Zika virus — four cases of which have now been confirmed in American Samoa, according to officials. There are currently more than 200 suspected cases of Zika virus in American Samoa, local officials say, announcing that the U.S. territory has at least four confirmed cases — including one patient who is pregnant. The territory's acting governor, Lt. Gov. Lemanu Peleti Mauga, "declared a Zika epidemic for American Samoa" after consulting with health officials at the end of last week, Samoa News reports. The news was announced at the end of last week by health and government leaders in American Samoa, which has a population of around 54,000, according to the CIA Factbook. "What we did was that we looked up the four cases that were tested positive and went back to the record book to look at some of the cases that have the same symptom profiles," Samoa News quotes epidemiologist Scott Anesi saying. "So the case definition of Zika is any two of the four symptoms such as pink eye, rash, joint pain and fever. So if you have two of those four, we are going to classify that as Zika, because we know that Zika transmission is ongoing." By declaring an epidemic, the territory is also placing its anti-Zika efforts under the control of a unified command, which will be guided by the federal Centers for Disease Control and Prevention. A CDC medical team is on its way to the island chain to join a CDC doctor who arrived earlier this year, according to local news site Talanei, which says officials are reviewing some 205 possible cases. In November, Samoa, the territory's larger neighbor to the west, reported local transmission of the Zika virus — meaning that mosquitoes in that island nation had been infected with the virus and spread it to people, the CDC says. No vaccine for Zika currently exists, the CDC says. 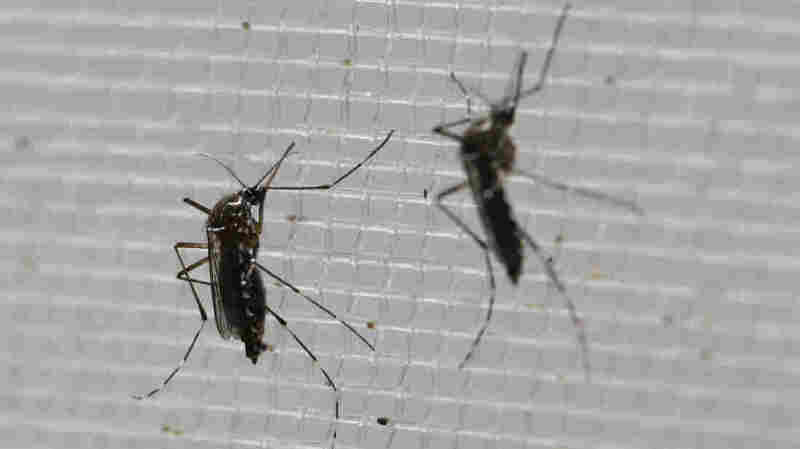 In addition to mosquito bites, the agency says, "Sexual transmission of Zika virus from a male partner is possible." You can follow NPR's coverage of the Zika virus here. Recent stories range from the Brazilian military's fight against the Aedes aegypti mosquito that carries the virus to a timeline of how what had been thought of as a mild virus expanded its reach.